Yesterday night, the Spanish crew performed a little dynamic resource discovery for you. 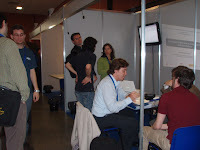 But firstly, I would like to say that the Demo/Poster Session was the most active of all EGEE User Forums I have attended to. Again, there was a perfect combination of food (great wine, cheese, ...) and networking. 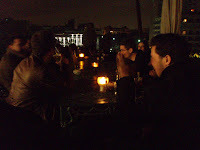 After the event, we moved to the 7th floor from our hotel, where a Ibiza style "terraza" was waiting for us. We asked for candles, even played some music on the laptop (I'm an amateur DJ, so I use to carry my playlists everywhere). Even if Etna is visible from there, we couldn't admire it. That was a good thing, as being at night, the only possibility so see it would be during an eruption ;-). 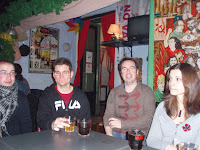 Then we moved to a nearby club called Barbarabar. However, we decided not to have a drink there yet, as a film was being played... a Spanish one! and we didn't want to bother the people there (we were speaking very loud). We asked for another place and they kindly, pointed us to a pub also nearby called Niesky. This pub, which was described as a "Communist resort" by its owners, was located inside an old house, using its two floors. 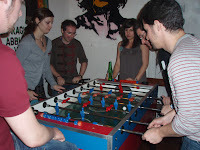 Drink prices were very convenient and... they had a Table Football! Playing is free, you only have to ask the lady at the bar for the ball. Time passed and pub owners asked us very gently to leave (they didn't loose their smile, even if we were partying very loudly). It was time to return to the Barbarabar, which was still open. If the club from the first night was decorated like the 80's, this one was like the 70's with a great style (we even congratulated its owners). Music pertained to a wide spectrum, going from Lounge to Indie (Pop, Rock and Tronic). When we executed internally a /bin/date, it was more than 3 a.m.! Not bad for a Tuesday in Catania, considering that people hangs out just on Wednesdays, Fridays and Saturdays. And now... Time to get back to the Conference!